Earlier this month, we published the 2017 Top IaaS Cloud Services Provider Pricing Comparison, a cloud pricing comparison of public cloud providers with data centers in North America. The report includes pricing for virtual machines (VMs) running Linux and Windows operating systems for hourly, monthly, annual, and 3-year contractual terms. Get the full 2017 Top IaaS Cloud Services Pricing Comparison Report here. 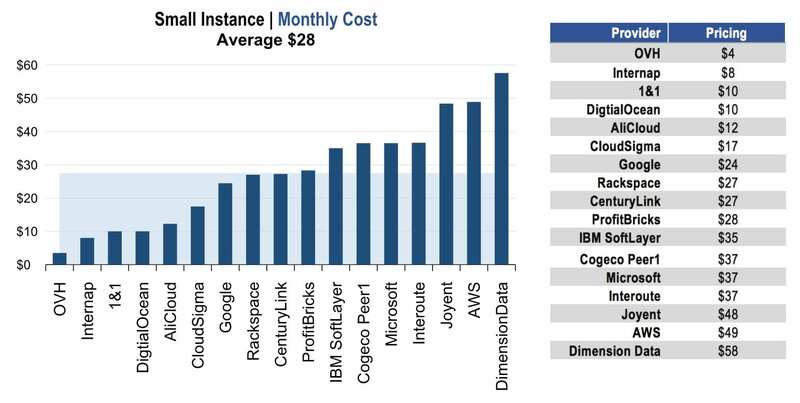 In the cloud services comparison, hyperscale providers ranked as some of the most expensive providers in the market. For the hourly and monthly pricing durations, Amazon and Microsoft generally fell within the most expensive third of data sets, whereas Google generally fell within the middle third of data sets. However, for 1-year and 3-year pricing, Amazon’s pricing was consistently equivalent to Google due to its progressively discounted ‘Reserved Instance Pricing’ structure. The following chart displays the pricing of small Linux VMs per month. OVH was the lowest-priced provider for small Linux VMs purchased by the hour, month, annually, and 3-year durations, and was 7.9x less expensive than the price average. One notable key finding from our cloud services comparison research was the lack of consistency in discounts available in the IaaS market. It can be very difficult to make comparisons between cloud providers as there is such a wide variety of pricing models and discounts offered. For example, Google offers Sustained Use Discount (SUD). This means that discounts of up to 70% for a monthly commitment can be achieved through their pricing model. AWS offers Reserved Instance Pricing where Standard Reserved Instances can provide significant discounts ranging between 24%-75%. Further discounts are available by paying for some of the usage up front. In comparison, Cogeco Peer 1, Internap and OVH do not publish any discount models on their websites. However, discounts are likely subject to case-by-case contractual agreements. Notably, Microsoft does not publish any discounts on their website but discounts are available for customers that meet a certain usage threshold through Microsoft Enterprise Agreements. 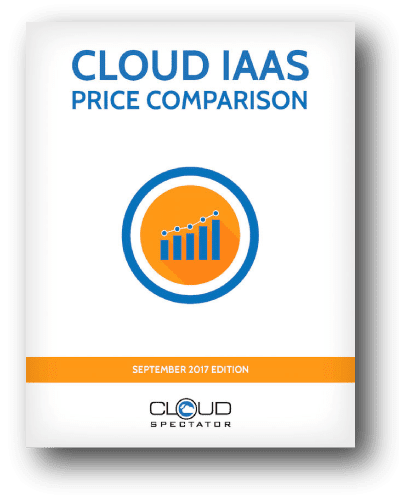 For more information on pricing, published discounts, and price differences between the listed public cloud providers, download the 2017 Top IaaS Cloud Services Providers Pricing Comparison.